Just as I was opening the windows to allow the cool sunset breeze to blow in, my Mom called to tell me it was the 26th day of temperatures reaching over 100 degrees in Dallas. I feel for everyone experiencing the extreme heat right now, I truly do. I ran into some people visiting from Canada this week who said it’s cooler here than it is in Manitoba. I don’t know what I did to be lucky enough to live in a place where it always cools down at sunset, no matter how hot it gets during the day. The Pacific Ocean is my air conditioner. We tell ourselves on cool summer nights that this will be the thing we miss most when we move back to the South. We open all the windows and pour some white wine to enjoy outside (we’ve been enjoying these bottles lately). We marvel at the goose bumps on our skin in July as we wait for the stars to start showing themselves in the sky. We both grew up with oppressing humidity and heat, and we’re afraid we might have a hard time going back to it. In case the weather is causing you to boycott using the oven, I compiled a list of my no-bake recipes. Some of these require the use of the stovetop, I hope that’s OK. Enjoy these recipes and remember that fall is on its way. It’s definitely nice to be where the coolWeather is when you know so many are suffering from extreme heat. I’m from Missouri where we’ve had triple digit numbers For weeks. While we have been vacationing in the cool Mountains of Colorado for an extended period of time, soon to end, I shutter at the fact that I will soon be in 100+ degree weather with high humidity. Providing no bake recipes is a brilliant idea. At least it gives heat sufferers something other to do indoors than watch tv to stay cool. Your recipes sound great. I will have to try them when I get home. Wow, my co-workers in Oklahoma were saying similar things about the weather. I definitely would not be turning on my oven, thank gd for all these delicious no-bake options! We just now had a power “blip” in the middle of typing my comment… hope this doesn’t show up twice! (And hope the A/C stays on!!!) Anyway, THANKS for this, Christina — I miss baking, but these are perfect. Also, I loved your statement: “The Pacific Ocean is my air conditioner!” :) Enjoy your wine and stars! A lot of these look gluten free too! I love your desserts, I’ll never forget when you made us raspberry cheesecake in cupcake liners with nilla waffers in college. YUM! This is a dangerous list… I am loving the grilled peaches and cinnamon ice cream idea – I think I “liked” that one earlier this week or maybe it was last. I gotta make it! Great list, thanks! I’m very thankful we’re getting a mild summer, it could be a lot worse here! But just wow for other parts of the country. Great list! I need desserts like these right about now! This is perfect! I love every one of these recipes! Not suffering from the kind of heat in the middle, east, south and southeast, BUT in “all is relative” world, it is hotter than I like! The frozen lemon mousse is calling me :)! What a great list. I live in the deep south and we can usually handle the heat – but wowza! It’s hot! love this! Thank you so much. I definitely bookmarked this. It has been so hot here, too and the last thing I want to do it turn on my oven. But, I need to get my baking fix in. These are perfect! I’m in Utah, and it seems like we’ve been having a pretty mild summer. I’m so glad I’m not roasting like much of the country!! 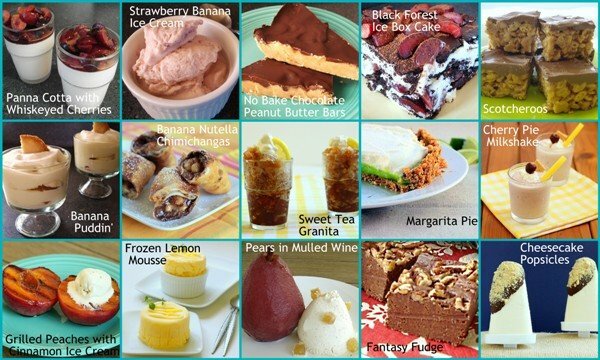 But I would definitely still enjoy any of these no-bake desserts!! I needed this list on Tuesday when I was using my oven for a dinner party on a HOT HOT day. We had a few weeks of about +33 C temps. It was crazy! It’s been pretty hot here, but more than that, it’s been HUMID. I need some of these no-bake goods in my life! We are extremely lucky! My relatives in Arkansas said it reached 114* the other day! Even if it doesn’t get that hot here in CA I still love a good no bake dessert! Thanks so much! I should not have looked at this before lunch! I’m going to be craving sweets all day! I am so jealous of all the warm weather everyone is having. Our summer has been more like autumn, yuck :( Nonetheless I still love no bake desserts anytime of the year. Your list are all great recipes, thanks for sharing. I just found your baking blog and can’t get enough! I’m always looking for scaled-down recipes to make for myself and another lucky person and now, thanks to your site, I have a TON of delicious options! This no-bake list is particularly appreciated at this time of the year; I’m ogling the sweet tea granita recipe as we speak. Thanks so much for posting!! These no-bake desserts are a go-to when the weather keeps us away from the stove. Thanks for sharing!